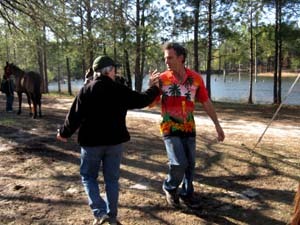 Merri Travels on Endurance.net: "Run Like the Wind, Bullseye!" 2010 WEG: Hot Desert Knight and Rider Farzad Faryadi - "Run Like the Wind, Bullseye!" He dons a cowboy hat, and climbs aboard his mighty brown steed: he becomes Woody and his horse becomes Bullseye, from the Toy Story movies. He cries, "Run like the wind Bullseye!" 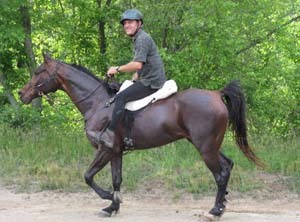 To a National Best Condition championship in 2008. To two Vermont 100 wins (2008, 2009). To a 20-year course record in the Vermont 100 (2009). And they still aren't done yet. Now, they are running for a slot on the USA team in the 2010 FEI Alltech World Equestrian Games World Endurance Championship. He's almost giddy about it. "I'm just starting," says Farzad Faryadi, 50, of Oakboro, North Carolina, "I'm excited! This is a second birth in my career!" Farzad had his eye on now 10-year-old Hot Desert Knight for a year before he was able to get his hands on him. A trainer friend of his had bought the horse because of his bloodlines (Desert Heat VF+ out of JA Flirtatious - he's a great grandson of Bey Shah+, Huckleberry Bey++, and Bask++). She wanted to turn him into a Western Pleasure show horse, and she worked on doing that with him for a year. But he was just too hot. When she called Farzad to offer Hot Desert Knight for sale in 2004, he said, "I ran to her home!" Farzad and 'Bullseye' - named after the characters by Farzad's children, when they watched the Toy Story movies together - got started on the trails right away. "He'd had a year of ring work, a good foundation, but he was green on the trails." Green, but obedient. And hot. Hot Desert Knight was a handful at first. He's still powerful but he's a bit easier to control now (after 7 years on the trails). But he also still likes to go, "and he's really fast! He has an easy 13 mph trot that is fairly smooth and he can hold forever," Farzad says,"though if he extends his trot and goes faster, he's not so smooth." They worked together about 6 months before they did their first Limited Distance ride together. "I took my time with Hot Desert Knight, because I'd made mistakes on my other horses!" The pair did two full seasons of LD's (30 miles and under) before they moved up to the longer distances. And it's paid off: Hot Desert Knight has completed 46 of 49 rides, including all 9 of the hundred milers he's been in. You could say the gelding excels at the longer distance: 8 of those finishes were top tens, 2 were wins, and in 2 he received the Best Condition award. He also received the 100 Mile High Point Award In the Arabian Horse Association Endurance High Point Award Program in 2008. One could also say Farzad is obsessed with endurance. He'd always loved horses as a kid, but in Iran he always lived in the city. He moved to the United States 31 years ago, but it wasn't until 11 years later he bought a horse. 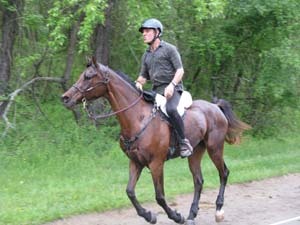 His farrier's wife saw him out riding his quarter horse in 2001, and, as she was an endurance rider, she invited Farzad to come to an endurance ride. And that was the very beginning of the amazing wild ride he's had. It's easy to see both Farzad and Hot Desert Knight are both having a great time in the world of endurance riding. "I love endurance, and you get to spend all day long on your horse. It's about great friends, great people, having a great time, and friendly competition." He's also one of the most popular riders in the east. Fellow endurance rider Angie McGhee says, "I remember the first time I rode with him and we got to know each other a little going down the trail. He is the friendliest, kindest person you'd ever want to meet. Goes on mission trips to South America to help build churches, and just has a very sincere goodness about him that makes everyone like him; always smiling and happy." He has a sense of humor, too. After finishing 2nd and getting BC in the 2008 100-mile AERC National Championship in Henryville, Indiana, Farzad thanked all the vets who had ever pulled him to teach him lessons and help him get better at the sport. Hot Desert Knight is in the prime of his endurance career, and last year made it look easy when he slipped into the top ten finish in the muddy mess of the Kentucky Cup last October - the pre-ride for the World Endurance Championship. 'Woody' and 'Bullseye' are still running like the wind, taking aim at being on the USA Team in September, for the Championship. With Farzad's great attitude, and his exceptional Hot horse, they just might make it.